THE REVIEW: A lot of the promotional material for this film references director Steven Soderbergh’s quintessential Ocean’s Trilogy. Heck, even the town locals at the end of the film call it “Ocean’s 7/11”. From the moment I saw the trailer I immediately thought I must see this movie for no other reason than Ocean’s Eleven is one of my favorite films of all time. 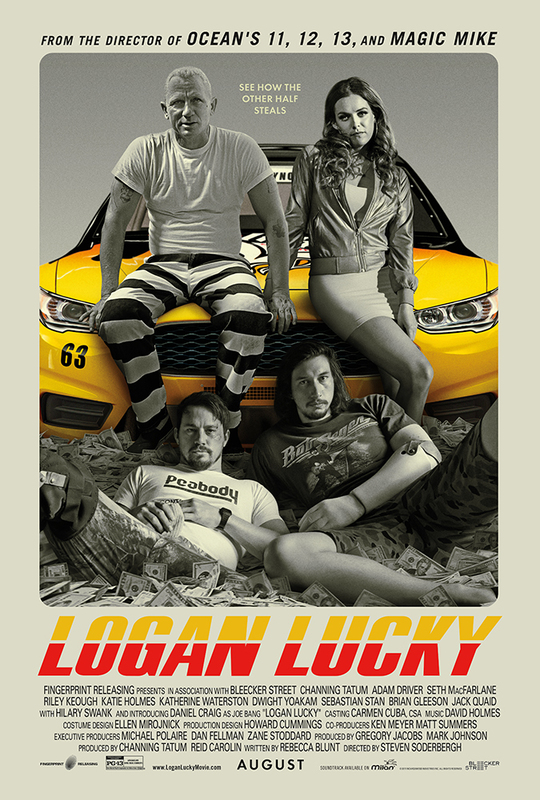 Unfortunately, I think Logan Lucky was a case where it didn’t live up to my own self-imposed hype. The only reason I’m dreading the forthcoming Ocean’s 8 is that I’m afraid it won’t live up to the original (well, Soderbergh’s original take, not the actual 1960 movie Ocean’s 11 which I have not seen). To be honest, the gut reaction to why I probably am not a fan of Logan Lucky is because it isn’t Ocean’s Eleven. That being said, there are some actual specific critiques I can levy against the film. First of all, Logan Lucky is slow — it lacks energy throughout much of the film. Part of the reason the film is slow is it spends quite a bit of time on the “why” of the film: why are Jimmy (Channing Tatum) and Clyde Logan (Adam Driver) robbing the Charlotte Motor Speedway? There really isn’t a good reason the film presents other than the brothers are both unlucky and facing hardships. No real catalyst that starts Jimmy with planning the heist — his ex-wife Bobbi Jo (Katie Holmes) is moving out-of-state, but it doesn’t really fit as a motive as presented in the film — and no real known skill to suggest this is possible. They do enlist the help of inmate Joe Bang (portrayed brilliantly by Daniel Craig), but the only other history we know about the brothers is they’ve committed “crimes”, brought upon by saying “cauliflower”. One of the ways I feel the film tries to make up for this lack of energy is with the music. It felt as though there was always a song playing, usually energetic-sounding, in an attempt to drum up excitement. “Well, nothing’s really happening here, but if we play a fast-paced song it’ll seem like something is happening.” No dice, at least for me. Actually it seemed to have the opposite effect where the music just slowed the pace down even further. Dunkirk is a good counter-example. Dunkirk has music blaring constantly throughout the music — loud, super energetic — but there it really gets your heart pounding. The music feels appropriate and helps evoke the emotion that should be gotten from the film. Logan Lucky on the other hand felt disconnected, as if there were no musical soundtrack to the film but I decided to play some music on Spotify while I was watching the movie. All that being said, there is still a heist; it’s going to grab my attention in some way. And it’s Soderbergh so it’s going to be an intricate and complicated heist with a few twists and turns, kind of akin to a Home Alone film filled with booby-traps. The acting is phenomenal, Craig especially but the whole cast is terrific. On a rainy day and under the right conditions, this might be the perfect movie you’re looking for to unwind, but sadly it’s not the kind of movie I could pick up anytime, any day.